Leading Manufacturer of gas detector from New Delhi. We are also involved in supplying sensitive gas detectors that are widely used to detect the presence of toxic fumes, gaseous vapours and other hazardous gases in varied applications, especially in mininng industry. These battery operated and portable gas detectors are equipped with a sound warning alarm system and three led indicators thar start working after detecting any sort of gaseous leakage in the working area. 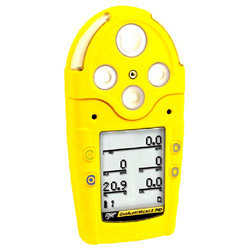 Looking for Gas Detector ?